Have you ever heard anything of being runner-up? It’s not a defeat but still not a triumph. Actually, it’s nothing. eCommerce is a fascinating world of competition, challenges, ups, and downs. And like in sports, you’re either the best or just failed. Looking for a forward-thinking solution, not to be one of those, who fell at the first hurdle? Considering how to break new ground and boost sales? Seeking for a tool, that can implement your “conquer-the-world” plan, smooth the workflow and take the eStore up a level? You’ve made the right click. Read through Ecwid to WooCommerce comparison, perceive the surprising truth and empower your business to operate at full capacity. We’re not going to supply the worst-kept data, but furnish retailers with shopping cart secrets and functions far more than any user would ever dream to have. Considering the switch to an Ecwid alternative? Scroll down, perhaps it’s precisely your golden ticket. It’s difficult to directly compare WooCommerce to Ecwid, as one is software while the other is a service, but we’ve assumed responsibility to meet the challenge. Ecwid is a Software as a Service solution, which comes as a free WordPress plugin as well. It's merely implemented from the official webpage and offers both free and paid options for running an eStore. At present, it hosts more than 21,000 sites all over the world. But this figure is minuscule when matched with a mastodon. What’s the first thing that pops into your head if I say eCommerce market share leader? Don’t bother wondering, since the answer is pure and clear: WooCommerce. These guys know exactly how to take over the whole industry: to date, it empowers 560,000+ websites with 7+millions of downloads around the world. How does it reach and keep the first positions? Created in 2011, WooCommerce continues to evolve in a positive direction to stay one step ahead of its counterparts. Enduring success is the best sign of the highest quality, isn’t it? However, all merchants shouldn’t choose an appropriate shopping platform, solely based on its general functionality, but bearing in mind individual requirements and demands, to deliver buyers the most enjoyable experience as well. Go on, we’ll show you, which aspects have to be taken into account before performing the switch. We’d probably have to start with the fact, that Ecwid doesn’t offer a free trial. There’s a free plan, which enables a merchant to launch or run an online store and list only 10 products. Furthermore, very disappointing that platform does not have an integration with a stripe to make refunds as WooCommerce has. Ecwid pricing ranges from $15 to $99, and if you pay annually, you’ll save around 17% on your payments (two months free per year). Some integration for what would be free services are only available on higher paid tiers, which is entirely fair. But it’s also a bit of a con, and there is some confusion as to which level you need to be on to unlock specific premium add-ons. Is Woo free? Yes, and it’s the most significant benefit of the platform (to pay nothing is better than little, right?). This toolkit will make selling products online very easy, and it will not cost you a thing. All you have to do is download WooCommerce, and it will turn any WordPress site into an online store. It’s an open source plugin, publicly accessible for free download, but if you’re not satisfied with its essential features, available for no penny, and thinking about something more robust and advanced, this cart offers priced license upgrades, extensions, and updates. Additionally, you have to buy a domain name ($15 to put on top) and hosting, that costs between $6.95 and $12.95 per month. Otherwise, for a businessman, who’s gonna roll in money it’s intangible and doesn’t wound the budget, yeah? Speaking of Ecwid, you’ve to create an account on their official website, select a suitable plan and then you’ll receive an HTML code string to install into your existing online shop. Having completed that step, you’re ready to go. Ecwid will be connected with your eStore page, and you can get started. For a regular Internet user, it will take a few hours of playing around with the settings to get the hang of major operations. We dare say that you barely have an outstanding coding background when starting the brand new eStore “on foreign soil”. With WooCommerce, you’ll be able to set it up without any pain in the brain. The installation process is just a matter of clicking next, next thingy and takes no time! An important point is that it is so easy to use that anyone can use it and integrate on their site to manage orders. WooCommerce allows for many individuals to work on a website. Before it was difficult as you needed a more advanced level of development skills leaving website updating to one or two people. Now when changes need to be made anyone can update the site. The admin panel is simple and convenient, and wise dashboard tells you all the time about gross sales on a daily basis and for the 30 day period as well. Are you looking for a website within some minutes without any technical knowledge? WooCommerce is your friend and teammate. Unlimited - email, live chat, priority phone support, 12 hours of custom development (yearly plan). On the other hand, if you’re on the venture or free plan, but interested in phone support, there’s an opportunity to pay for this service separately (price starts at $100; quite expensive, isn’t it?). Email and chat are at your service 24/5 (except weekends). Before you get too terribly excited about the possibility of phone support, you should know we’re not talking about live operators standing by for your call. Instead, you will need to request a scheduled call-back from within your control panel. Ecwid contends that the team can provide better support when they’ve had the opportunity to investigate your issue before the call. Seems like they’ve never heard of urgency. A large community of WooCommerce users. It the internet you can easily find a lot of useful information about this service, as well as many forums, documentation, FAQs, blogs, video tutorials and specialists to hire. In general, a really customizable service. As for personal help, you may submit a web ticket, which Woo experts will occasionally respond to via live chat. Ecwid offers plenty of different apps that let you expand the basic functionality of the platform. 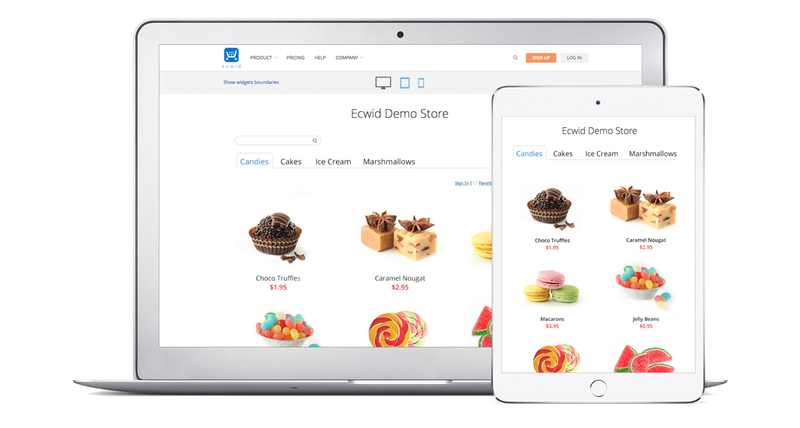 With a wide range of features, your Ecwid store can work like a clock: sell different types of products, including variable products, cross-sell, take advantage of various types of payment gateways like PayPal, Stripe, Sage. But benefits are never the full story, and you should know that there is a significant drawback. US-centric, which can cause issues with setting up shipping (individually calculating shipping costs automatically). You’ll have to spend a day inputting values from a spreadsheet to automate shipping cost calculations for your website. Perhaps a little more flexibility in "features" at the primary level would be excellent, however, it's still a fair deal. When it comes to WooCommerce, feel free to use the word “all-inclusive”. It has a lot of inbuilt features, but you can add a lot more customisation options via plugins. High integration with some of the best payment gateways, like PayPal or Stripe and also with some powerful eCommerce tools such as MailChimp. The stock management is excellent as well. Woo is compatible with most WordPress theme and plugins. The ability of pricing items, providing discounts, creating coupons and charging shipping fee is effortless with WooCommerce. Stock management is a nice feature here as well. You can track all our inventory without any problem. Ecwid’s customisation options should be valued and appreciated. You’re able to evolve and grow our eStore as designs on the website have changed over time to allow them to be similar very easily and quickly. There aren't enough user-friendly options on customising the look and feel of your store, especially the check out process. The use of CSS codes to improve the design is somewhat hard to get. Many of those necessary codes should appear as options for Ecwid users. WooCommerce provides you with the chance to edit any part of your online shop quickly and smoothly. This platform empowers you to customise all products in the best possible way. Imagine you have some technically difficult item that has a lot of variations depending on its elements. 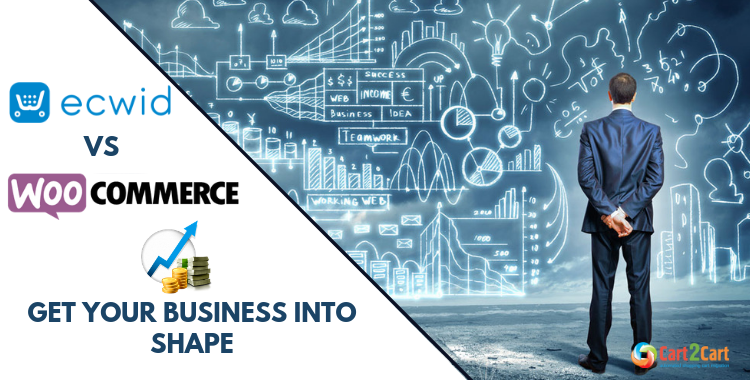 You would go mad creating each one independently, so here is WooCommerse to solve it - in the right place at the right time. You can introduce a simple product, or a variable one and the program will automatically generate all the variations of it. In case there are too many modifications you can use Composite Product type to let the customer choose himself each component at the moment of buying on your website and thus to get the product that suits him best. We’re sorry to disappoint, but Ecwid’s design in the free version is quite limited. The WordPress plugin doesn't work in all designer themes. If you’re stuck with such a template, you’ll end up embedding HTML code into a widget to get the store onto the page. You can create a design using controls, or, again - if coding is your bag, you can edit the CSS stylesheets (though not HTML). Do you still think that nothing could satisfy your demanding taste? You’re wrong. With WooCommerce your eStore can be more than just a webpage, you can actually turn it in a promotional instrument. This means that your online shop does not have to look like everyone else’s. Right now, there are more than 1200+ WooCommerce themes to choose from, so you can definitely find one that you like. Once you have picked the one you want, you can start experimenting with the colours and styles. If you get tired of a specific WooCommerce template, you can always change it. A lot of beautiful paid themes available online at a meagre price, so you can improve the design as you like. 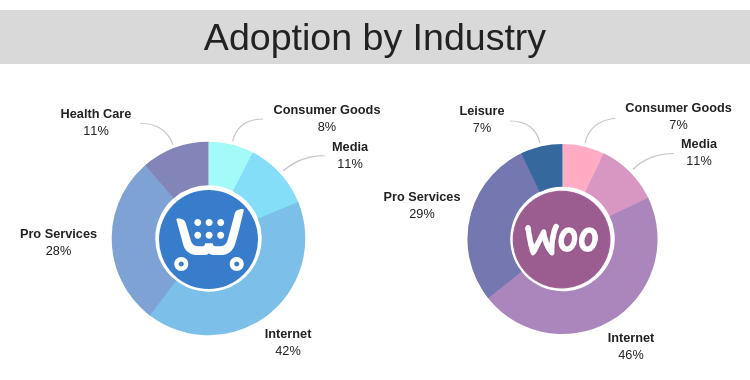 Having compared WooCommerce vs Ecwid the leader is too apparent for creating intrigue. The first platform can help you to build an awesome eStore, but it’s powerless to push you on the top. Ecwid’s functionality is somewhat limited, but every single feature is crucial when it comes to the market championship! Going with Woo, you can quickly edit any part of our shop, from the main page to the purchase button. It is very straightforward to configure. It comes with several free themes that look wonderful, and they do not take care of anything to use the necessary fundamental functions. The platform includes detailed order tracking and customer engagement tools, which allow your customers to look at their past orders and get updates on their delivery statuses. It also comes with different shipping options and tax settings. The wise and clear dashboard shows you only the data that you need, without unnecessary information. WooCommerce will efficiently manage and simplify selling products with tax and VAT if you wish to. It’s also standing for security, through using a secure method for product management and payment. But do not have a fear of perfection, WooCommerce gives the updates regularly to take care that the store owner always stays up to date! It’s time to rearm, and Cart2Cart will make you get more in this tedious task. Stop dreaming, perform you Ecwid to WooCommerce migration, start Free Demo and realise what you’ve planned! Make yourself known!